We’re going on about a month with no cable and I’m happy to report that my entire family is still alive. No one keeled over. No one had a panic attack. No one is in the corner of their room rocking and sucking their thumb. Shocking I know. The reason I’m being so dramatic is because I wasn’t 100% on board with this whole no cable thing. I love TV. I always have. My cooking shows ARE LIFE. What has our experience been? Keep reading…. The other night I was in the kitchen baking and I realized how incredibly quiet and peaceful our house was. Like pin drop quiet. I looked over and my 10 year old was reading. Yes, it was his homework assignment, but he was reading and he went over the amount of time he was supposed to read without realizing it. My husband was sitting beside my 10 year old on the couch, also reading. Yes, it was an ‘awwwwww’ moment for me. One of my teens was working on homework and another cleaning her room. I’ve been in the kitchen a lot more baking and experimenting with recipes. For some that might sound like a nightmare but being in the kitchen is therapeutic to me. I’ve made delicious things and my family is quite happy about that. We’ve all started reading more. When we do watch TV, it’s with intention, not just tuning in because it’s there. Also when we do watch TV, it’s more quality TV programs with an educational twist. I have been more productive with household chores and business to-do’s. We’ve talked to each other more. We’ve spent more time at the dinner table as a family. I’ve realized how many hours a week I wasted watching someone sing with hopes of not being voted off. Do I still have times I miss it? Yes. Will we eventually get it back? I’m not sure. But I do know things are great just like they are right now. While we were paying for cable, we were also paying for Netflix, Amazon Instant Video and weekly Redbox visits. We kept all of these and have been enjoying family movie nights, choosing programs with intention and scrolling through these services realizing how much they offer! Redbox – Our local grocery store has a Redbox by both the entrance and exit. We love this. I also really like being able to reserve a movie online, so I can be guaranteed that the movie we want is there. If you’re a Redbox Play Pass Member, you’ll receive double points in December every time you rent a movie or game! Anyone who signs up will be eligible to receive double points throughout the month of December. Play Pass is based on points and helps members receive free movie rentals. For example, you receive 10 points when you rent something and after 100 points, you get a free rental. You also receive free movie nights on birthdays and Redbox Play Pass anniversaries, plus additional surprises and exclusives along the way. We rented Maleficent the other night through Redbox and loved the movie. It’s a must see! Amazon Instant Video – If you’re an Amazon Prime Member, you have access to Amazon Instant Video. There are hundreds of free movies and TV shows to watch, plus you can rent or buy new releases and stream it to your TV or device through their app. Some of the current free titles right now include The Hunger Games, Star Trek Into the Darkness and season 5 of The Good Wife. Some of the new releases currently available to rent or buy include Guardians of the Galaxy, Maleficent and Disney’s Planes Fire & Rescue. Netflix – We’ve had Netflix for a long time and stream movies and TV shows from our TV, phones and tablets. I like how you can set up different profiles for each family member. The day I heard Gilmore Girls was coming to Netflix was a very good day indeed. Our teens use Netflix a ton, so it has been well worth the monthly fee. So those are the services we’ve been using instead of cable. So far so good. Do you have cable? Would you ever think of getting rid of it? For those of you who don’t have cable, what are your favorite services to use? Previous articleBoots, Boots and More Fall Boots – Shoes for the Family! 5 Types of Mothers – Which Type of Mom Are You? What’s an Advent Calendar, and Why Should Your Family Use One? I love that cutting out cable has been working for your family! We have cable now because it’s included in our apartment’s rent. We rarely watch it, so when we move we’ll probably cut the cable. All we need is Netflix and our favorite TV shows can be streamed online anyway! We’ve been streaming for 3+ years and love it. Yes, we each gave up something (some cultural shows for me, some sports for hubby, and the kids seeing their latest shows RIGHT NOW). But the cost savings and home life improvements are worth it. Streaming makes TV watching intentional. Another bonus is that there are far fewer commercials. It’s really improved our ‘consumer’ mentality. A great example is that the kids struggle to come up with wish lists for birthday and Christmas. They tend to ask for tickets to do things instead of trendy plastic toys. 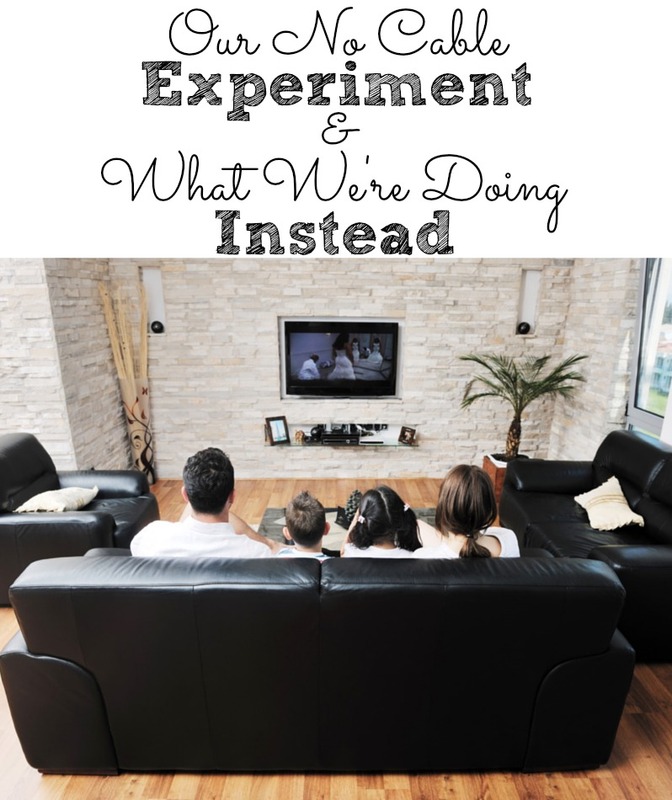 Getting rid of cable has supported our focus on experiencing life instead of being a spectator.